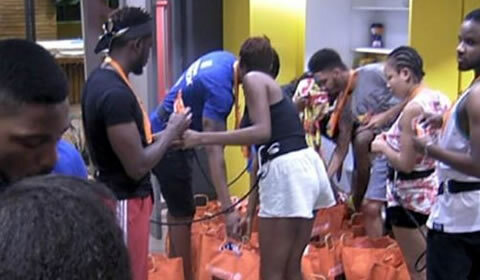 The Nominations surprise left everyone reeling but Big Brother just used that energy as a springboard for the first part of the Housemates' Task. It’s no secret that the Housemates all love food, they love eating it, talking about it and complaining when they don’t have it. So Big Brother decided to use their love of food and reversed it, providing them with bizarre and rather disgusting food that they either had to eat or “wear”. The Task was the perfect canvas for crazy expressions and the Housemates gave it to us full force. ALSO READ: Eight pairs of housemates are up for possible, who are you saving? Alex started screaming as the lid was taken off her bowl and chicken feet and heads stared back at her. She looked as though she was about to cry and was visibly having a low key panic attack. She then proceeded to gag and almost vomit until her partner for the Task, Lolu, literally forced her mouth shut and made her swallow it. The need for a win in the House was evident by all the Housemate’s persistence. Rico Swavey and K. Brule also gave a little performance as they gagged and K. Brule looked as though his world had just ended. A sweet, small victory for the Housemates came in the form of, you guessed it, food. Straight after the Task, Biggie gave them all their supplies as well as some cigarettes and this definitely lightened the mood. Even though there was a bit of a clash between Khloe and Princess, everyone seemed to just brush it off and chill. It’s going to be an intense week in the House so at least they are all stocked up. Dee-One and Leo began to make everyone laugh while they puffed away the stress of the passing day.